In continuing the recently begun series on love/hate sartorial relationships, I chose an item of elegant and yet comic status. It is one of the most theatrical accessories available to gentlemen; effete and yet at the same time, a strong symbol of a dying patriarchy. The cravat is an ancient wardrobe item and though it started as a simple length of cotton or linen, it evolved into a graceful adornment for the collar. 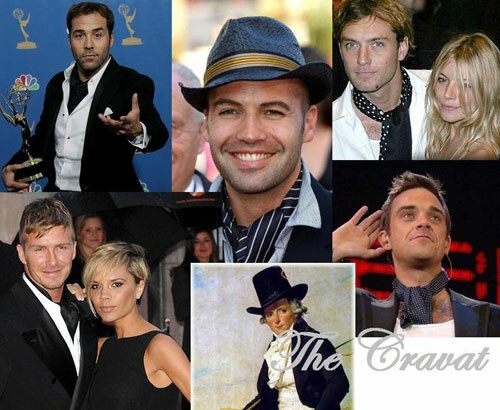 Nowadays, anything that seems to be worn around the neck, and tucked behind a shirt or jumper, is considered a cravat. Though the ascot is, to many, the last design of the true cravat, ‘cravattism’ is something that can happen to almost anything – in tradition with it’s origins as a humble stretch of fabric. Though it is frequently worn by traditional and conservative men, young and old; usually underneath a smart and stiff shirt and v-neck combination, there has been a recent flurry of experimentation, with the likes of Robbie Williams, Jude Law, David Beckham, Billy Zane and Jeremy Piven all embracing a style of neckwear normally associated with middle-to-old-age chaps who drive 20 year old Jaguars. Despite this stamp of youth and celebrity approval, many still find their noses turning (and possibly their stomachs), when they see willing guinea pigs promenading towards them with ruffles of silk concealing their neck. Frankly, some simply do not like this sort of adornment – if anything, to them the most attractive and modern of styles is the open collar and naked neck and of course, the cravat is the antithesis of this. Others might be rather put off by the connotations; the effeminate patterning indicative of a forgotten age of ‘the decorative man’, the concealment of flesh indicative of a very English repression. However, I consider it rather a shame this style has been maligned thus; tying something around one’s neck to good effect takes a skill and even artistry. And I think those capable of protecting their necks against the cold with such flair need recognition and not mere mockery. As an accessory, in my opinion, the cravat is an excellent item. Rather like the sartorial equivalent of a valance; it completes the effect, and covers up the awkward ugliness effectively and elegantly. For poor emaciated souls like myself, it offers structure and substance to a rather insignificant upper torso; like the moiré silk that conceals the flimsy and unattractive wiring sprouting from a chandelier. Then again, such ‘fuss’ is precisely the sort of thing that antagonists rail against; minimalism is a modern trend, in all aspects of life. Chaps turn up to restaurants in what looks like gymnasium attire, people furnish rooms with striking economy of colour or pattern, objet d’arts are more likely to be praised for their ‘purity’ or ‘simplicity’ rather than their ornate complexity: it’s surely no wonder that the cravat is seen as a hilarious prop, unnecessary and fussy. However, I think such style is due an honest revival, not merely a cameo. There is only so much ‘purity’ and ‘simplicity’ I can take before it all starts to get rather nauseating and pompous. Times have indeed changed, but they are changing still – I think there is call for a cravat Renaissance. It will be a challenge however, to shrug off that fustiness that has long been associated with it.